Repeated “kip-kip” or “jeep-jeep.” Song is series of chipping and tinkling notes. Description: Bill with crossed tips. Dark brown wings lacking bold white wing bars; dark tail. Plumage variable. 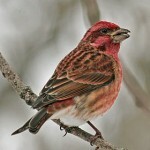 Most males reddish overall, brightest on crown and rump; may be pale red or scarlet or even yellow. Males always have red or yellow on throat. 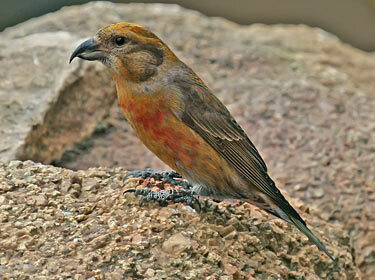 Most females are yellowish-olive overall; may show patches of red; throat is gray. Juveniles are paler overall and boldly streaked with brown; may show thin white wing bars. 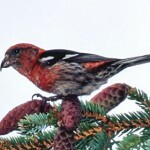 Habitat: Breeding birds are found in coniferous forests. Migrants and wintering birds are also largely confined to coniferous habitats, but may be seen foraging in stands of sunflowers or ragweeds. Where in Nebraska: Irregular spring and fall migrant and winter visitor across the state. Most common in Panhandle. Local but regular breeder in the Pine Ridge area. Field Notes: The unusual bill of these birds is designed for opening pine cones. 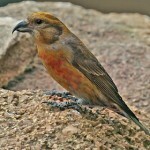 The bill pries the scales apart, and the bird uses its flexible tongue to extract the seed. Fun Facts: Rare and possibly extinct in Newfoundland because of competition with the introduced Red Squirrel.